Grandis: What's going to happen? Ayerton: The end of the world. 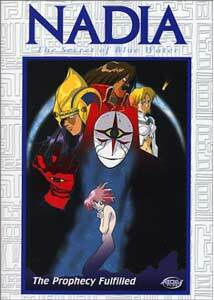 In this final volume in the Nadia television series, the last three episodes bring the tale of young Nadia and Jean to a conclusion as they face up against the Gargoyle and the mysterious Emperor Neo. Many further revelations about humanity are included, as are some spectacular sequences of destruction. While there are elements that feel familiar, there are also some anticipatory moments. The former is a Return of the Jedi-like sequence where Gargoyle and Emperor Neo seek to get Nadia to join them in their endeavors for world conquest, as well as numerous other references to the film. These episodes also anticipate Independence Day (or borrows from Earth vs. the Flying Saucer) with a wave of global destruction that will please those looking for spectacle. The trip has overall been an entertaining one, with a few dead spots. I should mention that I loathe the anime genre of magical schoolgirls. While this series briefly ventures into such realms (mainly through the powers of the mysterious Blue Water gem), it does so in a properly marveling manner that doesn't take such things for granted. In particular in this final volume, science fiction in the grand Jules Verne style rears its head, with all manner of speculative material being thrown at the viewer with barely time to catch the breath. In these last episodes, we also see the obsession of director Hideaki Anno with Biblical themes, with Noah, Adam and Lot's wife figuring heavily into the climax. This of course presages the further development of such themes in his classic Neon Genesis Evangelion. The best part of this series is the characterization. We've seen Nadia as headstrong, ashamed, enamored, furious, depressed, motherly, caring, violent and jealous. In short, she's one of the most fully developed characters I've run across in many years of watching animation. Also of particular note is her love/hate relationship with young Jean and her even more complex relationship with Captain Nemo. Even the stock comic characters such as the Grandis gang feature a variety of moments in the spotlight that provides them with an interesting backstory and empathetic reactions. The big climax is a bit overly drawn out, running through all three of these last episodes (not to mention really starting in episode 36 in volume 9), but the buildup has been long enough that it's not excessive. The finale is often shocking (and bloody), and is preceded by an unforgettable cliffhanger as Jean must choose whether to shoot Nadia or face the enslavement of the world. I can hardly imagine having had to wait a week between episodes when it first ran on television in 1989. It still holds up well, with its freewheeling anachronisms and its timeless human relationships. This is a highly enjoyable series that is well worth checking out. Image Transfer Review: The picture quality in these last episodes is quite nice, apart from some el cheapo animation tricks where only the mouths of characters move for long stretches. Colors are as usual bright and vivid, with sharp black lines. There's really nothing at all to complain about this time around. Audio Transfer Review: As usual, both the English and Japanese tracks are presented in 2.0. The music and dialogue on the English track are quite clear and hiss-free; however, the Japanese track has an unusual amount of hissiness to it. With all the explosions and major gunplay here, there's plenty of surround activity that will have you smiling. A surprising amount of low bass is also present, making for an attractive listening experience. For the most par,t the Japanese voice casting has been better than that for the English version. In particular, Gargoyle is very sinister in the Japanese version, while he sounds rather like a banker in the English version. Extras Review: The text interview on vols. 8 and 9 are followed up here by a set of text interviews with the remainder of the English language cast (even King, the lion cub! ), which makes for a substantial extra this time out. Clean opening and endings are again provided, for those who find that important, as well as a brief trailer for the followup motion picture. Wrapping up the package are the usual brief and generally cryptic previews of Soul Hunter, Princess Nine, Power Stone, Excel Saga, Steel Angel Kurumi and Wild Arms. The big climax to Nadia's story doesn't disappoint, with all the stops let out. While the running time is short, there are some more substantial extras than usual, making this a fitting finale. But wait, there's still a movie to come!